Today’s guest writer is Stacy Mantle, Founder of PetsWeekly. 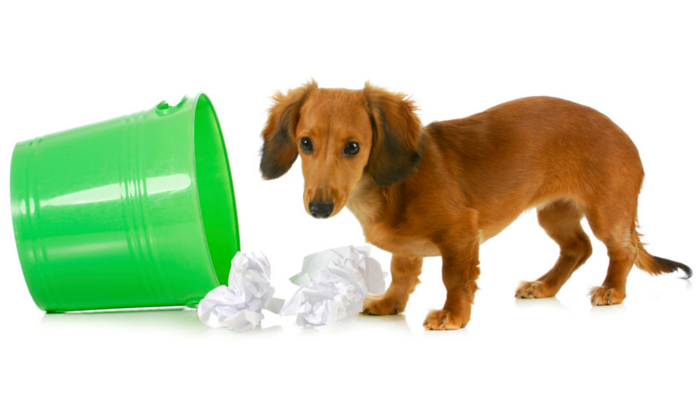 Stacy is writing about something many dog parents wonder about: keeping your dog out of trash. If you were asked to list the many positive attributes of a dog, there’s a good chance you’ll be including his incredible sense of smell. Dogs are curious creatures and while they rely on many natural abilities, their sense of smell is one of the most important. Dogs boast a sense of smell that is about 40 times greater than our own. A dog’s nose has an estimated 300 million olfactory receptors (compared to only 6 million in a human’s nose). In fact, scent is so critical for dogs that they have an area of the brain completely devoted to analyzing smell! Scientists estimate that the average dog’s ability to smell is about 40 times greater than our own. To a dog, sniffing is like reading a book or watching a movie – he sees the characters, the plot, the symbolism and more. This makes garbage (and other stinky things) an important part of your dog’s life. It’s also why your own life may become more complicated if your dog is intent on disrupting it with fun, old-fashioned garbage eating. If you’re tired of picking up after your pet, there are some things you can do to prevent your dog from getting into the trash. Buy a dog-proof garbage can. This is the simplest way to address the problem. You may be surprised at the type of cans that are available, if you haven’t bought one in a while. Choose one that has a “butterfly lid”, preferably aluminum for the sturdiest build. These close without a lip, so dogs can’t access it as easily. Outdoor Trash Hideaway: If you can’t leave your trash cans in your garage or other enclosed area, consider picking up a trash hideaway. These cans have no seams, which makes it nearly impossible for animals (wild or domestic) to open. Pet Gates: There’s no shame in having pet gates to keep your pets from a specific room or area of the house. But, remember that it’s not always effective. It’s good practice to have rules in place for your pets and one of those rules should be, “no dogs in the kitchen.” Kitchens are hazardous areas for the most part, and it’s very easy for a person or pet to get injured by knives, hot stoves, and even heavy plates while moving around one another. If you don’t need your pets in the kitchen, it’s a good idea to train them early on to avoid the area. Teach Your Dog, “Leave it.”: There are a few commands that every dog should know that could save his life. “Leave it” is one such command. This is a useful command for many situations, including daily walks when they run across something tasty-looking and might be tempted to pick it up. That “something” could be toxic. Leave it also extends to the garbage cans. Remember that positive training is your best solution for working with animals. Begin training your dog that the trash can is not dog-friendly area early on and continue that training throughout their lifetime. Stacy Mantle, Founder of PetsWeekly.